I knew when I saw Linda's skirt that I just had to make that. Zoe had picked out these fabric's and they were sitting in stash waiting for inspiration. I felt the skirt would need something to be worn with it, so I made two blouse's, she can mix the tops with the skirt. The tops also look cute worn over jeans. This was the first time I used my gathering foot and I liked it much better then using the ruffler. The designer suggested the ruffles not to to tight as they tighten up in the wash. The blouse's are sewn from a oop pattern, which I love for it is fuller and longer then the new patterns, the pattern is simplicity 7670. 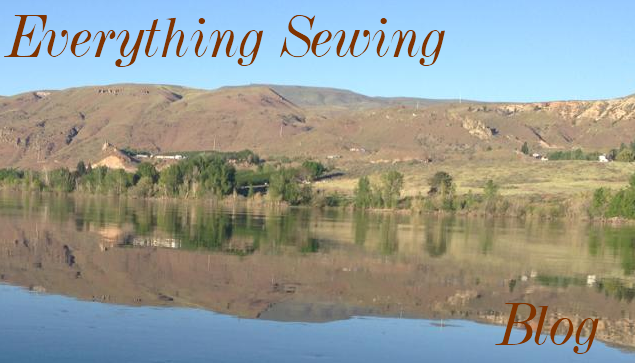 I did not realize how much I lost in being away form my sewing machine for so long. I can admit now, it was a fight with myself to even want to sew. 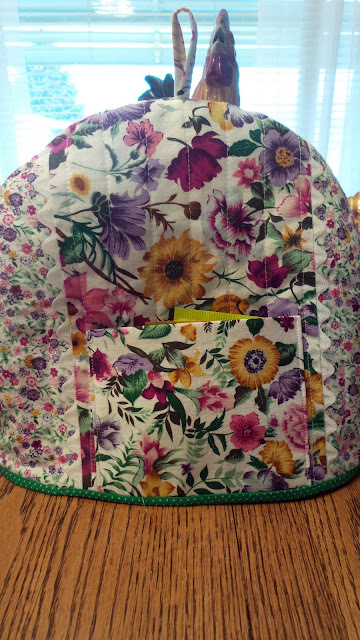 I decided I would set a time limit and would spend the time sewing even if I did not feel like sewing. To do this, I said one week for my precious granddaughter Chloe, who now lives in Arizona and the other week would be for Zoe, who has been after me to make her something. This is the results form my first week. I know, I made plenty of sewing mistakes but that all in re-learning. The dress is very simple strip skirt. I know she love's bright colors so it should be fun. The little jumper is from the Bonnie Blue patter Hunter/Holly. The applique is from designs by JuJu. This little set is also a Bonnie Blue pattern, Lydia. I has many variations but since it is warming up in Arizona it is something she can use now. I had so many ideas and I thank you all: As you know I was going to go for the skirt. I had to add a fabric to make it work and after many trips to the fabric store I was not finding anything, plus the word dress kept poping up. DRESS? I only had a yard. Then a friend mentioned sundress, there was that dress word again. I knew I would still have to add a fabric to make a dress. Well, there sitting on my fabric shelf was a pink fabric. Would the pink work? Most of the pinks I held up to the fabric took on an orange tinge and looked horrible. I pulled out a pattern and thought this will work (I hope). The reason still was the word sundress. This is a sundress plus a jumper. The pattern Simplicity 2680. My only hope now is that Zoe likes it. 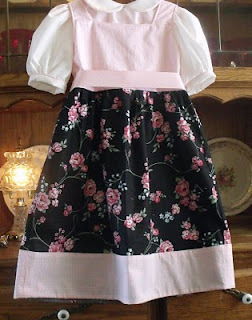 I also added a blouse, with pink trim on the collar and sleeves. Of coarse I had to add a hat plus a bow. I have gotten so many ideas on how to use the problem fabric, I now wish I could use them all. Thank you all so much for helping me. Thought I would let you know that right now this little skirt sewn by Linda is at the head of the list. I don't have enough fabric, so will have to come up with something for the runching. 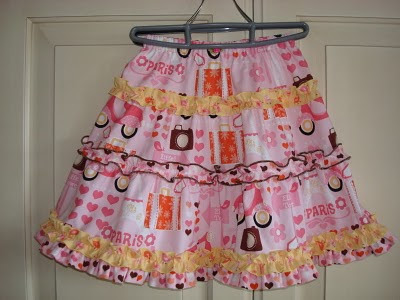 Linda made this skirt using a pattern from YCMT.http://www.youcanmakethis.com/info/bundle-pack-savings/Tess-Ruched-Ruffled-Twirl-Skirt.htm. Now, I do have a couple more ideas that might also work all thanks to you. Do you think I might need to find more of the problem fabric? I need some serious help!! See this fabric? It was given to me some time ago and for some reason I can not turn down free fabric. It has been in my stash always getting pushed aside as I pick fabric for a project. Well!! Miss Zoe just happened to go through the stash and pulled out, yes, you guessed it THE FABRIC!! "Oh ganma, I just love this will you make me something?" She left, I put the fabric back. Well, that continues until now, the first thing she heads for and pulls out is the dreaded fabric. So, here I am asking for help. I just can't seem to come up with anything for a seven year old that has that much black in it. So today, I pulled out the fabric, some patterns and still hit a wall. Please help me come up with something (there is a yard) . Is there another fabric I could add to it? maybe in a ruffled skirt? Something with some smocking? I just don't know.